Making homemade pizza for me is sometimes tinged with a bit of PTSD (Post Traumatic Stress Disorder) because the very first time I made pizza at home – sometime in the mid ’90’s – I ignorantly used a regular mouth thermometer to measure the temperature on the boiling milk. The mercury in the thermometer vaporized instantly and shot out the back of the thermometer right into my face. I didn’t even know mercury was toxic at the time! But I did know it was hard to clean up so I searched for those little silver balls, but never found any. Years later, I realized the mercury must’ve just vaporized – into it’s most toxic form. I inhaled a lot of it. Later hair, urine, and blood tests showed off-the-charts levels of mercury and I had a slew of classic mercury poisoning symptoms (rosacea-like rash on my face, random flushing of the face, anxiety attacks, social withdrawal, moroseness, dulled thinking, dyslexia, depression, etc.) for years until I finally got a diagnosis. I did low dose oral chelation per the Andrew Hall Cutler, PhD protocol for two years, and a lot of my cognitive symptoms did clear up. But I’m afraid that the mercury did untold damage in my organs, body and brain, and I am still trying to recover my health today. But I digress! Back to the pizza: Instead of making dough from scratch these days, I discovered a prepared pizza crust mix by Namaste Foods that is gluten free and relatively tolerable to me. 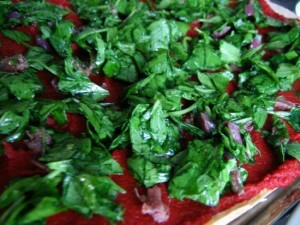 It makes creating a delicious gourmet homemade pizza easy as pie, and lets me focus all my creative energy on the topping! It’s made with brown rice flour, tapioca flour, arrowroot flour, xanthan gum, garlic, onion, Italian seasoning, salt, cream of tartar, baking soda, and ascorbic acid. Since I can’t tolerate any of the tomato sauces sold at my local health food store, and I don’t normally want to spend the time making a tomato sauce from scratch on days I am making pizza, I typically use a tolerable organic tomato paste or fresh tomato slices as my base. Then I layer with a green – like arugula leaves or pre-steamed broccoli florets – and decorate with bits of deep purple Peruvian olives, caramelized onions (I like ’em crispy! 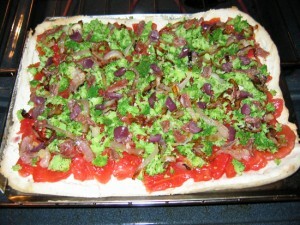 ), minced garlic, and anchovies. YUM!! Yes, I’m an anchovy girl. You might not be, so use whatever favorite topping ingredients you have on hand. These are my favorite ingredients for a topping, but you should use your own. Have fun, be creative! Follow directions on the Pizza Crust package for making the crust. If necessary, pre-cook any items on the stovetop. I choose to caramelize my onions and steam the broccoli beforehand. 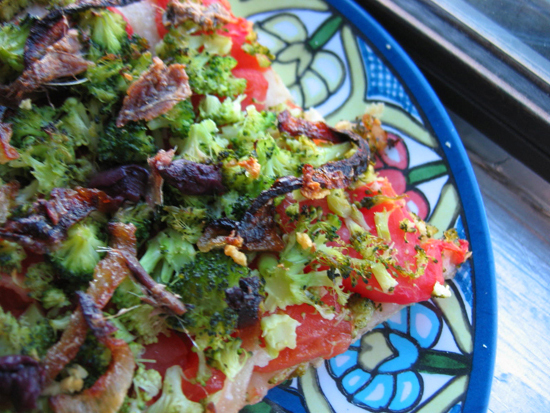 Layer ingredients on crust after cooking per the package directions, starting with your tomato base, adding the greens, and then other toppings. Cook pizza until done. I usually have to cook mine almost double the recommended time to get the crust crispy. Your time may vary depending on your stove and the thickness of your dough.